• Georges Island: For the friends of fear, the history of Georges Island will be a fright delight! Originally used as a prison for Confederate soldiers during the Civil War, the island and Fort Warren are said to still be haunted by the Lady in Black, a woman said to have been hanged on the island after she failed to break her husband out of the jail. Even if you don’t catch a glimpse of a ghost, the decommissioned fort features a museum and guided tours. • Little Brewster Island: The rocky isle furthest from Boston promises history and adventure. 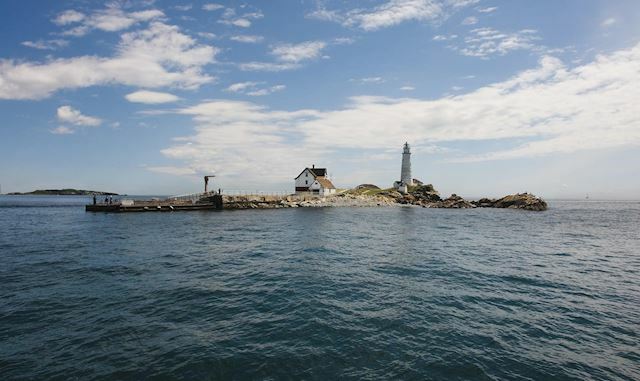 Home to America’s first lighthouse (originally erected in 1716, but the current model went up in 1783), Little Brewster is still home to the Coast Guard, which operates the lighthouse visible as far as 27 miles away. Only accessible as part of a three-hour Boston Light Climbing Tour (bostonharborislands.org/little-brewster-island), Little Brewster doesn’t feature concessions, so be sure to pack a lunch to take with you on your sea-faring afternoon. • Spectacle Island: Those looking to connect with the great outdoors should have Spectacle Island at the top of their itinerary. This 105-acre island features five miles of hiking, tall hills with unobstructed views of the Boston skyline and surrounding harbor, and sandy beaches to balance out your summer bronze. Thursday night clambakes are extremely popular in the summer and require reservations on bostonharborcruises.com.